Today, freedom is so closely associated with the United States that most people still view America as the ultimate symbol of freedom. This is one reason why the desire to immigrate to the United States from almost anywhere in the world has not waned for more than a century. Because of this image, the idea that Americans are constrained by restrictive ordinances and rules seems contrary and therefore difficult for most citizens to accept.Vladimir Shlapentokh and Eric Beasley argue that the idea of basing American society upon unadulterated freedom in all spheres of life is both unrealistic and simplistic. The authors define freedom as the ability to choose one of many available alternatives. They note that this concept of freedom sometimes leads to a paradox: occasionally, freedoms are expanded through the creation of additional restrictions because the restrictions provide people with more alternatives. Thus, being free or restricted is not an all or nothing proposition, but rather a question of degrees.Many works discuss restrictions in relation to a particular area of life, but none of them explore the magnitude of how limitations shape people's everyday lives. Restricting Freedoms is unique in that the authors provide case studies that illustrate a wide variety of social contexts in relation to religious activity, noise-making, and sexual activities, among others. 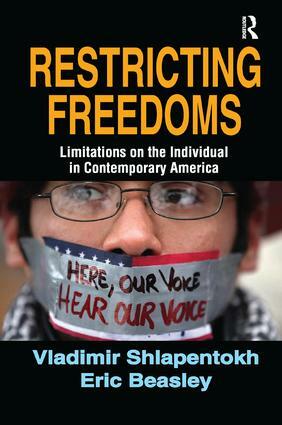 This overview of the role of restrictions in American life will be of interest to all American readers.